Readers will enjoy the range of emotions evoked across these narratives which include humor, danger, love, and passion. These are a few lines from a smattering of stories from the collection. This collection includes stories of South Indian immigrant life in America told from various perspectives including a girl’s awakening to racism not only against herself, but other races during high school and later in college; a man and his wife battle the growth of their lawn in their first home; a young woman struggles with the death of her father. 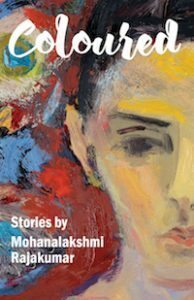 The debut short fiction collection by writer Rajakumar, Coloured and Other Stories is a multi layered look at South Indian immigrant life in America through the eyes of men and women confronted with mundane changes that challenge them to either retreat into themselves or connect with those around then.